Greg has started 5 successful software firms using the Bootstrapping method, and this business philosophy influences all of his advice to entrepreneurs. Bootstrapping involves starting a business using customers’ money rather than investments. The risk in getting started is lower, because you spend more time with customers and less time with investors. Plus, you will find out sooner, rather than later, if you have a viable business idea. You will also end up owning more of the business yourself if you are successful. If you are thinking, “Oh yeah, but to grow fast you must have professional money,” think again. RightNow doubled revenue and the number of employees every 90 days for 2 1/2 years with no outside capital, and was cash flow positive the entire time. Want to learn more? 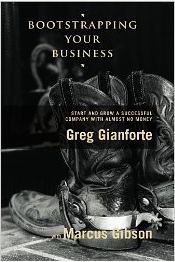 Read the Inc Magazine article entitled Start with Nothing or get a copy of Greg’s book Bootstrapping Your Business. If you are looking to start a business in Montana, contact us and we’ll send you a free copy (please include your mailing address in the contact form). Also check out Bootstrap Montana. This micro-loan program has provided dozens of zero-interest micro-loans to rural Montana entrepreneurs that follow Bootstrapping principles, and was originally funded by a gift from Greg and his wife Susan. Bootstrap Montana is now administered by the Montana State University School of Business.